The Wildings have an idilic life in the country. They’ve abandoned the craziness of California, gotten hitched and moved to the English countryside. They live in a picture perfect house, surrounded by chickens, horses, dogs and acres of rolling fields. What they don’t have is access to the really great Mexican food they used to get in LA (poor things). 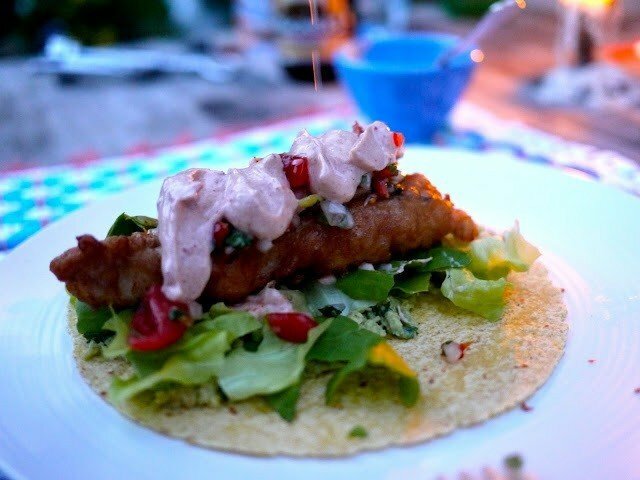 So, seeing as I’ve been staying with them for a couple days I thought it was only fair that I whip up one of Mrs Wilding’s favourite dishes, beer battered fish tacos. Mr Wilding is gluten free, so these are gluten free versions (but you’d never know from the taste). We covered the table in deliciousness and got stuck in. 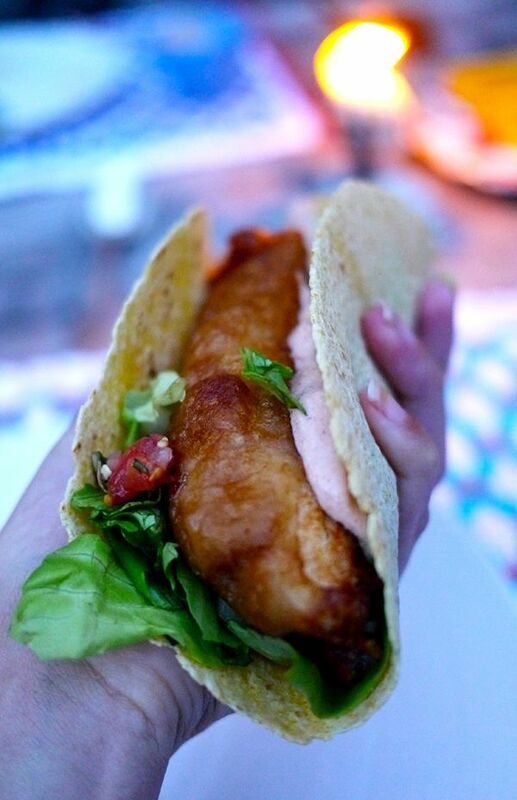 In every mouthful you get the sharpness & freshness of the salsa, followed by the crunch of batter, the rich meatiness of the fish, the creamy spice of the sauce, the smoothness of the guacamole & the tang of lime. It’s like a fist full of heaven! To make enough for four you’ll need: 4 filets of fresh white fish (haddock, halibut, snapper, grouper) 1 box Gluten Free Batter Mix (I used Isabel’s Free From) 1 bottle gluten free beer Vinegar Oil, for frying light mayonnaise fat free fromage frais great hot sauce 2 handfuls cherry tomatoes 1 small onion 1 handful fresh coriander (cilantro) 1 or 2 jalapeÃ±o peppers 1 head of lettuce GF free tortilla wraps Salt & pepper Bag of limes (at least 4) Start by making your sauce. Grab your mayo, fromage frais & hot sauce. Mix about a cup of fromage frais, 3 or 4tbsp mayo and a really good hit of hot sauce together to make a sauce. This is pretty much up to you depending how spicy, creamy you like it but you want a good kick. Just make sure it’s mixed well. Put it to one side & move on to your salsa. Chop up your onion & put it into a bowl. Pour in 2tbsp of vinegar, cover and put it in the fridge for about 30mins. This seems odd, I know, but you wont taste the vinegar. It just draws some of the oomph out of the onions so you wont overpower everyone with their flavour. Once they’ve marinaded a while take them out & pour away the vinegar. Chop your cherry tomatoes & jalapeÃ±os and add them to the bowl. 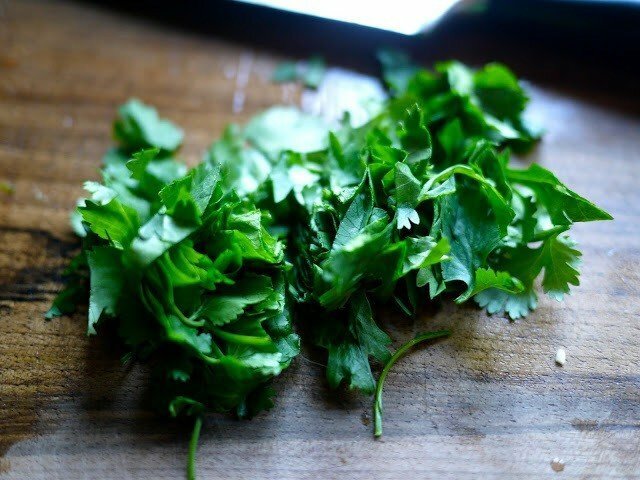 Roughly chop a handful of coriander (cilantro). And add the juice of one lime. Now pour the whole thing out onto your chopping board. And chop it all up together. You want manageable, nibbly salsa. When you’re happy scoop it all up with your hands (leaving the excess liquid) and pop it all back into the bowl. Add a sprinkling of salt and place to one side. Grab your lettuce and tear it up. Rip it into bite sized chunks and put into a bowl on the side. Now you can get onto the main event, your fish. 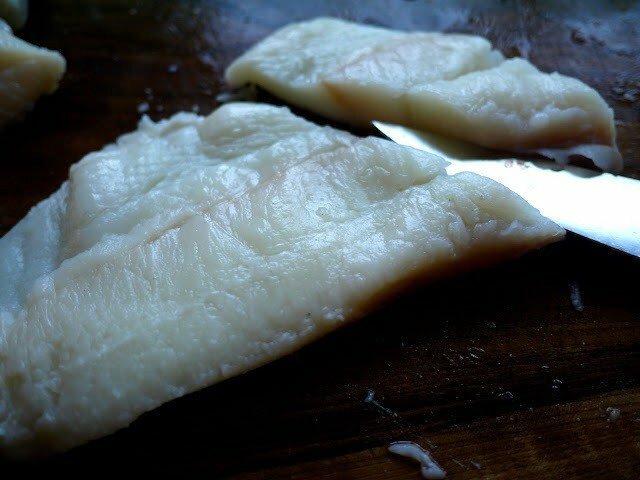 Slice your fillets into inch thick strips. Salt & pepper them generously. Mix up your batter. You’ll need about a bottle of beer to one box and some vinegar (I ran out and had to use balsamic, so my batter is a little dark). In a big, deep saucepan add your oil until it’s about 2inches deep. If you have a frying thermometer (you clever thing) heat the oil to about 180C/350F. If you don’t have a thermometer, dip in a wooden spoon, if it sizzles around the spoon it should be nice and hot. Cooking with hot oil is obviously a risky business so be careful. Keep dogs, cats & kids well away. Wear an apron and turn the extractor fan on. You’re going to want to set up a bit of a production line. Coat your fish in batter & gently lower into the oil. Use a spatula to keep it from sinking & sticking to the bottom. You’ll want to cook one or two at a time so you can keep an eye on them. After about 4mins the batter should be golden brown and the fish cooked through. Gently lift it out of the oil and place it onto a paper towel. You can keep them warm in the oven as you go if you want to take the pressure off. 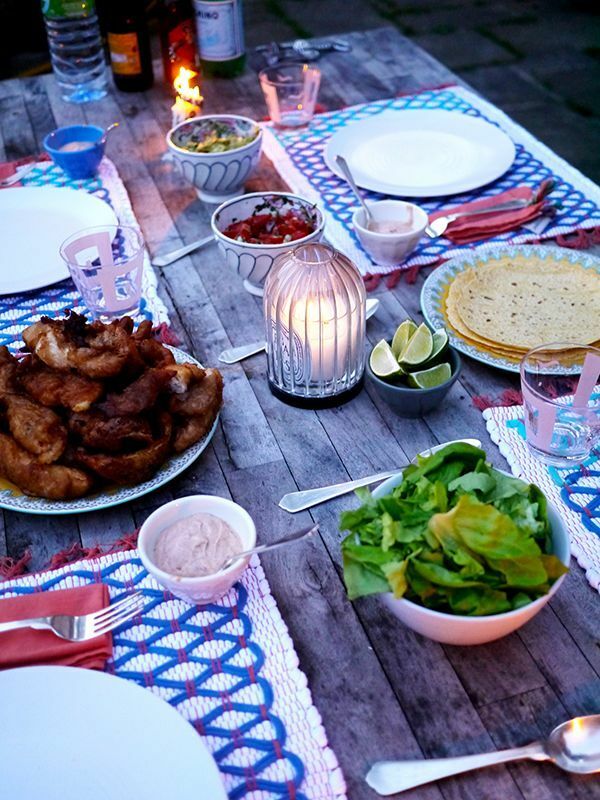 Once you’ve fried all your strips, heat your tortillas & take it all out to the table. 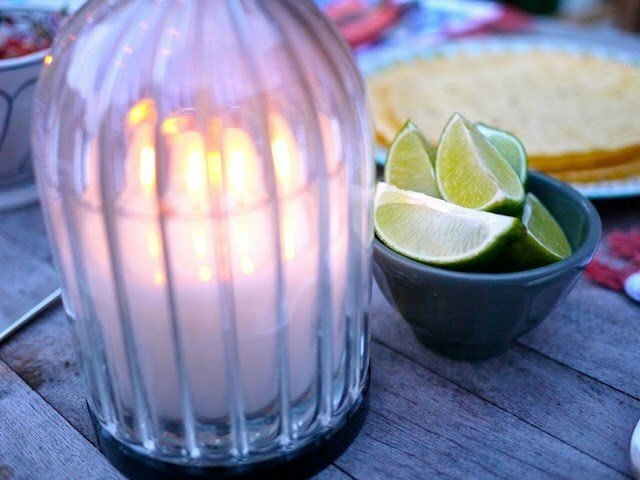 You might want to chop up a couple limes for people to squeeze at the table. And pop a little of your creamy hot sauce into individual pots for everyone, if you’re feelin’ fancy! Wrap it all up nice & snug. Sorry Charlie, that’s nacho taco! 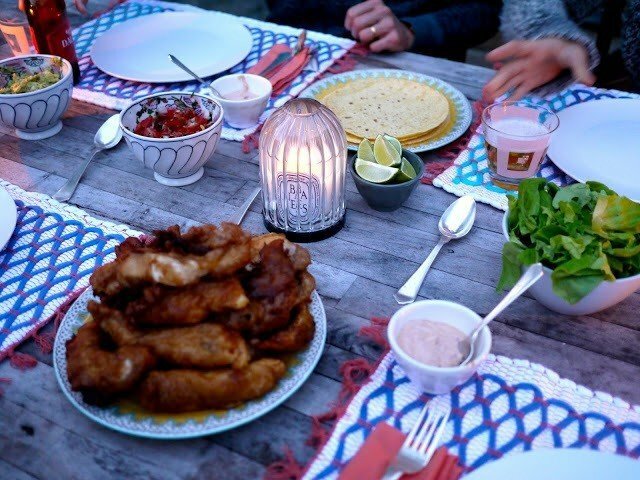 Serve with a crisp white wine or really cold beers. 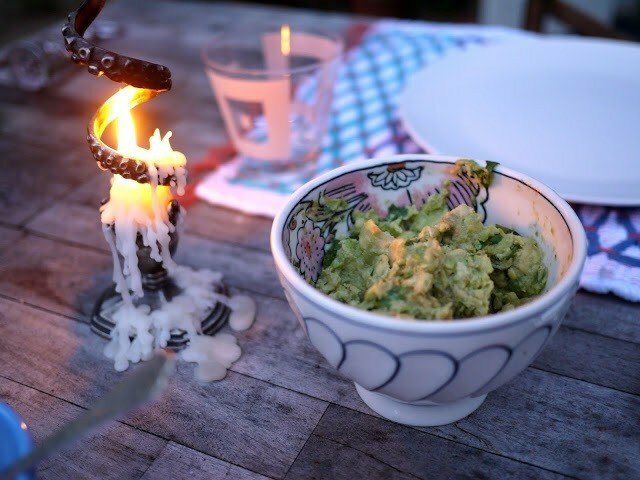 Stay up and trade stories until the candles give up on you.